The two Frenchmen are among the most popular creative minds of the 21st century. Their designs oscillate between refined, organic forms and powerful optics. They are characterised by their evocation of imagination and a creative approach: “The user decides!” is the motto of the Bouroullec brothers, and by that they are referring to the freedom to combine and use their items according to the user’s own personal requirements. Freedom is also the key notion in their first bathroom collection. 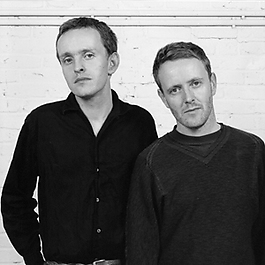 The brothers Ronan and Erwan Bouroullec were born in Brittany in 1971 and 1976 respectively and have been working together since the mid-1990s. They are united by their quest for perfection, but at the same time it is also a constant challenge for two so very different personalities to work together. In 2007 they were discovered by Cappellini, a grand master of Italian design, who gave them their first industrial projects. Thereafter they worked for well-known companies such as Vitra, Magis, Kvadrat, Established & Sons, Ligne Roset, Alessi, Issey Miyake, Cappellini, Axor and, more recently, Flos and Matiazzi. The designer brothers have always remained true to their experimental approach, which is crucial to their creative work, whether this concerns room designs, furniture design or architectural projects, textile wall systems or extensive collections. Several exhibitions at major museums have acknowledged the work of Ronan and Erwan Bouroullec, including the Design Museum, London, and the Museum of Contemporary Art, Los Angeles. In the autumn of 2011 the new Centre Pompidou Metz will offer them the opportunity to showcase a major, comprehensive exhibition of their work.